When did SHAEF / Eisenhower move HQ from London to France during WWII? The Military Agency Records of the National Archives indicates "SHAEF was located at London until August 1944; at Versailles, France, August 1944-May 1945; and at Frankfurt, Germany, May-July 1945." Wikipedia cites noted military historian Stephen E. Ambrose (Citizen Soldiers, Simon & Schuster, 1997, p. 199) as SHAEF having moved from London to Versailles "by December, 1944" (four months after the date indicated in the National Archives). Which (if either) is correct - and can additional substantiating documentation be cited? A comprehensive history of SHAEF can be found at the US Army's Centre for Military History. The relevant volume of the US official history, The Supreme Command, can be downloaded here. Pages 275-78 have the history of SHAEF locations. To summarise, at the time of D-Day the Main headquarters was in Bushy Park, near London, and the Forward HQ was at Portsmouth, both in the UK. The first advance HQ on the continent was opened at Tournieres, twelve miles southwest of Bayeux, on 7th August, and was quite small. The Forward HQ started to move to Jullouville, France, on 28th August. This was near the HQs of the Allied Expeditionary Air Force, the Allied Naval Expeditionary Force, the U.S. Strategic Air Forces, and the French command, which were located in and around Granville. The Forward HQ started to move to Versailles on 15th September, and officially opened there on the 20th. A small advance headquarters was opened on 19 September at Gueux, about seven miles north-west of Reims, and the Forward HQ moved there on 17th February 1945. At the end of September, the Main SHAEF HQ started to move to Versailles, and that was completed on 5th October. A Rear HQ was left in England, which moved from Bushy Park to Bryanston Square in London on 9-10 October. So both the sources in the question are partly wrong, but an accurate answer is quite complicated. 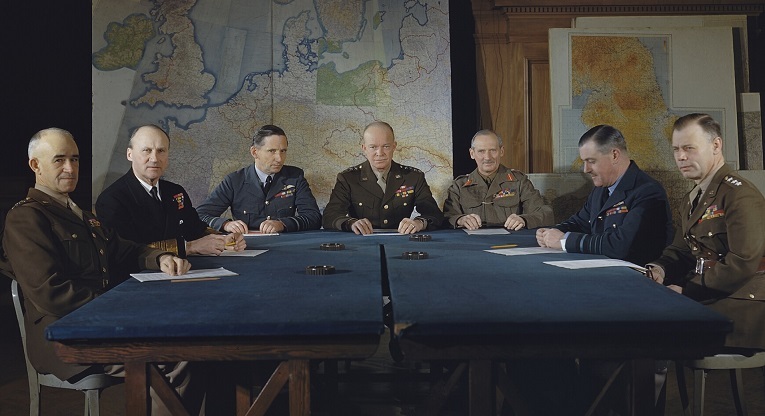 where they distinguish between SHAEF HQ in England, Portsmouth Advance Command Post, Advance Command Post in Normandy, and SHAEF Forward in various places, and SHAEF Headquarters in Versailles. At the end of September, various echelons of SHAEF Main began their move from the United Kingdom to Versailles by air. The move was completed by 5 October. Rear Headquarters, SHAEF, consisting of approximately 1,500 officers and men, moved from Bushy Park to Bryanston Square in London on 9-10 October. A small contingent was located at Goodge Street Tunnel, which was now used as an underground storage place for important SHAEF records. Apparently the book is available at ibiblio.org so you can read the entire section. Even at the end of the war portions of SHAEF remained in the UK. Interesting reading though. Not the answer you're looking for? Browse other questions tagged world-war-two military eisenhower or ask your own question. When did the allies start evacuating from the Dunkirk mole during the Dunkirk evacuation? Why did American public opinion move away from isolationism in 1940-41? In WWII, why did people not run away from executions? What was American anti-tank doctrine during WWII on paper, and how did it differ from in practice? When and why did tank crews cover their tank markings in WWII? Why did France surrender so quickly during ww2?